Why Has Project Management (PMBOK) Hindered Instead of Advanced Transformational e-Government? Transformational e-Government offered the hope and promise to revitalize and modernize public services; reinvigorate and improve services to citizens, business, and governments; and create an exciting environment for employees to work and contribute. Countries world-wide are inexorably engaged and urged forward by both push-and-pull motivational pressures to use technology to improve democratic participation, social harmony, and economic sustainability. While e-Government's first decade has been much more transactional than transformational, radical changes affecting e-Government are needed in this decade. But progress achieved thus far was not without struggle. The project failure rate is so high that transformational e-Government progress is stalling. This paper identifies a synergistic compendium of ten key challenges that prevent progress in transformational e-Government and assesses the effectiveness of the North American standard for project management, the Project Management Body of Knowledge (PMBOK), in managing these challenges - and finds it wanting. Transformational e-Government is the continuous innovation in the delivery of services, citizen participation, and governance through the transformation of external and internal relationships by the use of technology, especially on the Internet. When introduced, it offered the hope and promise to revitalize and modernize public services; reinvigorate and improve services to citizens, business, and governments; and create an exciting environment for employees to work and contribute. Countries world-wide are inexorably engaged and urged forward by both push-and-pull motivational pressures to use technology to improve democratic participation, social harmony, and economic sustainability. Transformational e-Government has not been the success hoped for around the world and a number of the barriers preventing success have been identified and analyzed (Dawes, 2009; Nordfors, Ericson, Lindell, & Lapidus, 2009; Oxford Institute, 2007; Sharif & Irani, 2010; Weerakkody, Janssen, & Dwivedi, 2011; United Nations, 2008; United Nations, 2010; World Bank, 2002; Ziemann & Loos, 2009). It has been harder, slower, and more complicated to deliver than what was originally expected, specifically from a business transformational agenda (BCS Thought Leadership, 2005; Roy, 2006). Transformational e-Government promised hope for government transformation, public sector renewal, and revitalization of the role of bureaucracies in the 21st century. 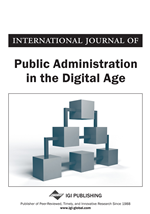 e-Government delivered primarily on the transactional success of using the Internet to allow citizens closer and more direct access to government programs (Weerakkody, Janssen, & Dwivedi, 2011); important and valuable, but not of the significance and benefit that was predicted. Transformational e-Government remains slow and halting (Aikins, 2012) and shackled to the time-honoured approaches of managing existing organizational assets rather than reaching out to create new management capacities that business transformation demands and technology affords. Even in Canada, where e-Government was rated by Accenture number one in the world for five years in a row (Accenture, 2005, 2006, 2007; Government of Canada Foreign Affairs & International Trade, 2006), it is seen as being primarily a transactional success as opposed to a transformational one (Roy, 2006). Internationally there has been a high and critical failure rate related to IT solutions (Aikins, 2012; Fraser, 2006). More recently the failure in IT solutions that was the bane of transactional processing is now appearing in e-Government initiatives (Aikins, 2012; Arif, 2008; Heeks, 2008; Janowski, Estevez, & Ojo, 2007). e-Government failures are often hushed up (Heeks, 2003) and as Misuraca (2009) pointed out, the majority of e-Government projects are failures as high as 70-80% and are not meeting the “messianic” expectations. Failures are costly; as per Irani, Al-Sebie, & Elliman (2006), the United Kingdom Parliamentary Office of Science and Technology reported that cancelled or over-budgeted e-Government projects were greater than 1.5 billion British pounds.